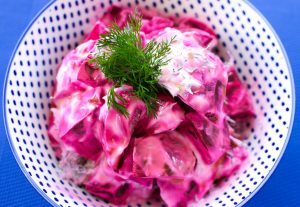 This eye catching dish is easy to make and the addition of kefir gives it an extra probiotic hit. Make sure you use a thicker kefir and add it gradually so that you don’t end up with a beetroot soup. You can add Greek yoghurt to your kefir to give it more viscosity or omit the kefir completely and use Greek yoghurt on its own. I came across this dish one year in Crete whilst working on my last boat. It came as part of a mezze dish served with stuffed vine leaves, a couscous salad and some other bits and pieces. 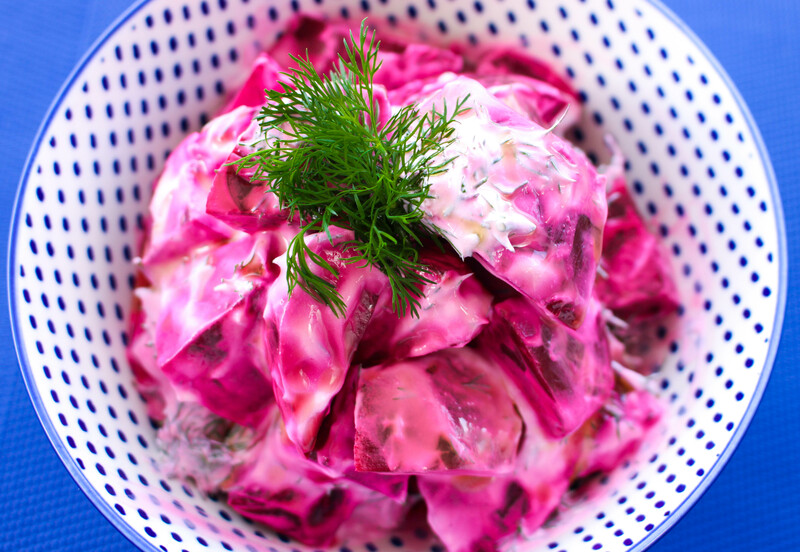 A change from the classic cucumber tzatkiki and ever so much prettier to look at, this salad is a winner. Boil the beets in salted water with a drop of red wine vinegar until cooked through. Drain then set aside to cool. You can use a pot of iced water to speed up the cooling process if you like. Peel the beets then place in a large bowl with a dash of red wine vinegar, the grated clove of garlic, a small amount of lemon zest, salt, pepper and some chopped dill. Mix well. Stir in the Greek yoghurt and a small amount of keffir to dress the beets. Serve with some chopped dill and a drizzle of olive oil.